JJVA is proud to introduce our in house training program from Genetic Potential Academy (GPA). GPA’s training philosophy, outstanding reputation and proven results made them the perfect partner for our training facility. GPA provides personal development services to all ages, athletes, post rehab patients, or any individual wanting to improve personal fitness and overall health through a customized, goal-driven, total wellness program. GPA offers Sports Performance Training, Personal Training and Strength and Conditioning Programs at our location. Jarrett comes to us from Mississippi where he first started his journey as an athlete, coach and trainer. He played multiple sports throughout high school at Pearl River Central in which he became captain of the basketball team. This led to him playing at PRC Community College and did some practice squad with Ole Miss basketball while finishing his bachelors’ degree in exercise science. He has spent 1 year as an intern coach with the Ole Miss Strength & Conditioning staff as well as 1 year with the Southeastern Louisiana University Sports Performance staff. He coached basketball, football and powerlifting for Pope John Paul II High School in Louisiana before moving to Yulee. Fitness and sports has always been a passion of his. 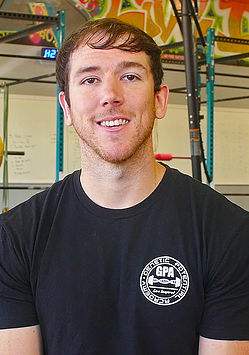 He has been training clients and athletes of all ages for 3 years now. A handful of the athletes he has worked with are now in the NFL and NBA. Jarrett loves being involved in the community around him and wants to see people become better every day. Regional Training Packages (7 Months)* Training Begins Monday after Thanksgiving. *1 Session per week choose from available days and times above. Once day/time is chosen, must remain the same. * Must purchase for the entire season. Can be added to payment plan. Can be divided: 1 person at $60/hour; 2 people at $30/hour each; 3 people at $20/hour each. Each additional person at $20/hour each. 45/45 – 45 minutes of speed and agility with certified GPA trainers and 45 minutes of cage time with your coach. Max group 25. 60 minutes of speed / agility and strength conditioning with certified GPA trainers.